Yes, at the moment the combination of Reclamation Sage , Tower Defense and Vivien Reid does the trick. 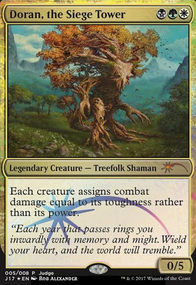 I am sure that at some stage I will find another card that I really want in the side-board, which will most likely mean replacing 2 of the above with Crushing Canopy . At this point in time I find Tower Defense to be more versatile than Sagittars' Volley and it is cheaper to cast. 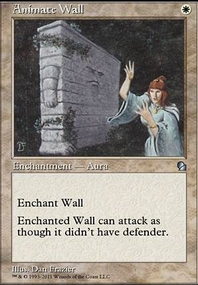 I suppose that if 1/1 token creature decks become popular again then Sagittars' Volley becomes a must. Rude Awakening seems right up your deck's alley. 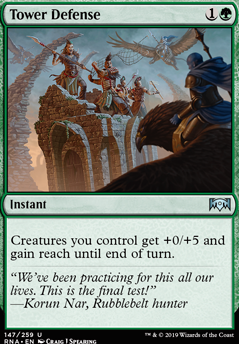 I will agree that anti-flying seems like a niche card, but as a fellow monogreen player, I can also attest tto the need for reach. Spidersilk Armor , Tower Defense , and Dense Canopy are all good ways for green to give dragons, angels, demons, and spirits the bird.